A campaign has been launched to commemorate VC winner Private Samuel Harvey in his adopted home town of Ipswich. Private Harvey, of 1st Battalion, York and Lancaster Regiment, won his medal at the Battle of Loos in 1915. An account of his actions states: ‘On 29 September 1915 in the “Big Willie” trench near the Hohenzollern Redoubt, France, during a heavy bombing attack, more bombs were urgently required and Private Harvey volunteered to fetch them. Harvey was 30 years of age at the time and had three brothers in the Army at the time. Born near Manningtree, he enlisted at the age of 19 at Doncaster, and served seven years with his regiment in India, proceeding into the reserve a few weeks before the war broke out. Private Harvey went out with the original Expeditionary Force and had been wounded twice before the battle of Loos. About the middle of September 1915 Private Harvey was looking forward to a holiday in England. His regiment was at Béthune, when it was ordered back to the firing-line, the journey being made by motor-lorry. The men of the York and Lancaster Regiment were disappointed at losing their well-deserved rest, but this quickly passed when they became aware that big things were about to take place. ‘We longed to be in it again,’ said Harvey, ‘rather than going home’. His regiment went straight into action, to assist the Canadians, who were surrounded by German bomb-throwers. 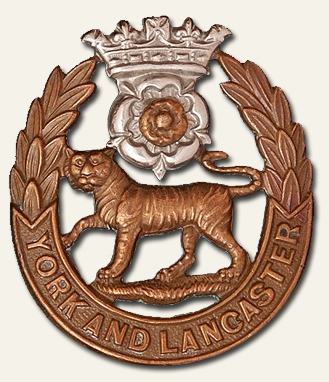 Certain trenches had been lost, and the men of the York and Lancaster Regiment were ordered to regain them. Harvey lived in Ipswich after the end of the war. He worked as an odd job man, but developed a fondness for alcohol, perhaps as a result of his wartime experiences, fell on hard times and was often to found sleeping rough in the town centre. He died on 23 September 1960, aged 79, at Stowmarket in Suffolk. His only possession was his miniature VC medal group. It is rumoured he had traded the full size medal for drink many years earlier. He was buried in an unmarked grave, which was given a headstone in 2000 after a local campaign. Aside | This entry was posted in News, Soldiers of the Great War and tagged 1915, Battle of Loos, Ipswich, Medals, Samuel Harvey, Suffolk, VC, York and Lancaster regiment. Bookmark the permalink.